Taking place from May-October 2009, Hanging Out at No Rio is project that invites nine visual artists to explore ABC No Rio, its history, and the changing face of the Lower East Side. ABC No Rio began with The Real Estate Show, an illegal art exhibition about land use and gentrification mounted in an abandoned building at 123 Delancey Street in 1979. Today, No Rio supports activities from art exhibits to punk shows and provides space for other progressive organizations like Food Not Bombs and Time’s Up. A community center that has maintained its allegiance to both art and activism, No Rio is representative of a New York that is fast disappearing. Soon, the existing structure at 156 Rivington St. will be torn down to make way for a new No Rio building. 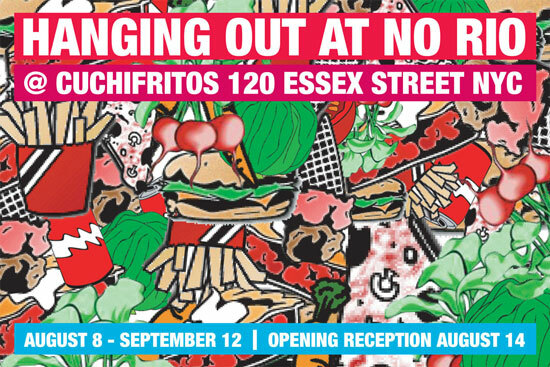 From August 8-September 12, 2009, Cuchifritos Gallery in the Essex Market will serve as a platform to engage the public in thinking about No Rio and its ongoing legacy. Rather than taking a top down view, the project encourages investigation through a series of informal events and conversations. Out of these interactions, related activities will continue to emerge and new work by participating artists will be presented in an exhibition at ABC No Rio from September 24-October 15, 2009.